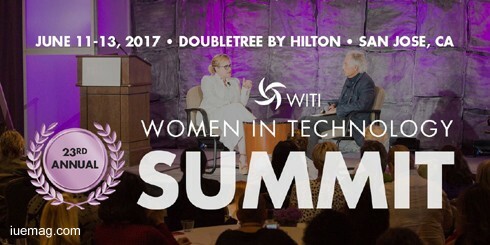 SAN JOSE, California – WITI (Women in Technology International) (WITI) today announced a 30 percent spike in registrations for its 23rd annual Women in Technology Summit, to be held June 11-13 at the Doubletree Hotel in San Jose, California. The conference is on track to exceed 1,300 attendees converging in Silicon Valley to build strategic connections and learn from senior female leaders about impactful ways to advance women’s careers in the technology industry. “The Women in Technology Summit is committed to delivering best practice collaborative tools, connections and strategies designed to increase innovation, competitiveness, and revenue to the organizations, men and women who attend our annual event,” said Carolyn Leighton, founder and chairwoman of WITI. This year’s Summit format includes WITI’s popular Coaching Track featuring over 120 breakout circles and one-on-one mentoring sessions. The WITI Industry Network (WIN) panels will dive into vertical topics like AI, VR, IoT, AgTech and Blockchain while Summit Workshops will provide 60-minute intensives on skills like building business plans for tech startups, making your pitch skills worthy of your ideas, and breaking biased habits. WITI Board Co-Chair Amanda Coolong is returning as the Summit emcee, and will be joined on stage by confirmed speakers such as Cindy Owyoung, founder of Breaking Glass Forums; IBM Master Inventor and Distinguished Engineer Doreen Galli, PhD; and Beena Ammanath, executive director of Data Science Products at GE. Additional value adds will include an integrated Business and Technology Expo featuring 30+ companies with a demonstrated interest in empowering women in tech, the Women in Tech Career Fair produced by the Professional Development Network, and the 22nd Annual Women in Technology Hall of Fame Awards Induction Ceremony on Monday, June 12th. The iUeMagazine team is delighted to work with the WITI Summit as Online Media Partners & is expected to bring Unlimited Inspiration for all readers from the proceedings of this event. Staying tuned to the enriching updates from this event is recommended. Any facts, figures or references stated here are made by the author & don't reflect the endorsement of iU at all times unless otherwise drafted by official staff at iU. This article was first published here on 2nd May 2017.